Inevitably, the list has a strong US flavour, and it gives me particular satisfaction to rank high in a jurisdiction which is not my own and with a blog which (for reasons to do with its origin) carries the word “eDisclosure” in its title rather than “eDiscovery”. That is because it began (in 2007) as a commentary on the disclosure rules of England and Wales – the only jurisdiction to have renamed the process from the term used everywhere else in the world. 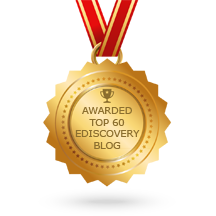 I have discussed the differences (or lack of differences) between eDiscovery and eDisclosure in various articles on this blog, all with the conclusion that, while “disclosure” is the required term when talking of the Civil Procedure Rules of England and Wales, “discovery” is right for most purposes. In practice I tend to write “eDisclosure / eDiscovery” to help Google to serve it up as widely as possible. Much as I may sneer at the oft-heard US view that “US eDiscovery is two years ahead of the rest of the world” there is no doubt that many of the ideas and initiatives, and most of the software, originates in the US to meet the requirements of US rules. Although many of my articles have a US theme (and most of my speaking events take place in the US), the hope and intention is that they will also provide useful information for those practising in other jurisdictions. Since Twitter is the only one of those I really use (plus the grim, grudging duty of publishing links to the ghastly LinkedIn), it must be Twitter I must thank for any alleged “influence”.